In light of U.S. Rep. Mike Honda’s lawsuit against his November opponent Ro Khanna alleging unethical and illegal conduct, Khanna’s campaign manager resigned his post to avoid being a distraction. "At his request, Brian Parvizshahi will step down as campaign manager,” Khanna campaign spokesman Hari Sevugan said in a statement late Thursday. Honda’s (D-Silicon Valley) campaign is claiming Khanna’s campaign accessed proprietary campaign donor information and then used that information to “accost” Honda supporters via email. “I would liken it to a modern day Watergate. This information was stolen. It’s theft. That’s very serious. It’s a federal crime,” Michael Beckendorf, Honda’s campaign manager, said during a news conference. The lawsuit filed on Thursday in U.S. District Court in San Jose alleges that Parvizshahi had access to exclusive Honda campaign information in 2012 when he worked as an intern for the Arum Group, a fundraising consultant firm hired by the Honda campaign. As an intern, Parvizshahi was granted access to a Dropbox account folder that contained fundraising information related to Honda’s campaign, the suit contends. Parvizshahi left the internship after one month, but the lawsuit says his Dropbox account access was not revoked. Parvizshahi began working for the Khanna campaign in 2014. “The law is simple. If you leave a place of employment and you continue to access your old employer’s information, it’s wrong and it’s illegal,” Gautum Dutta, the attorney on behalf of Honda’s campaign, said. 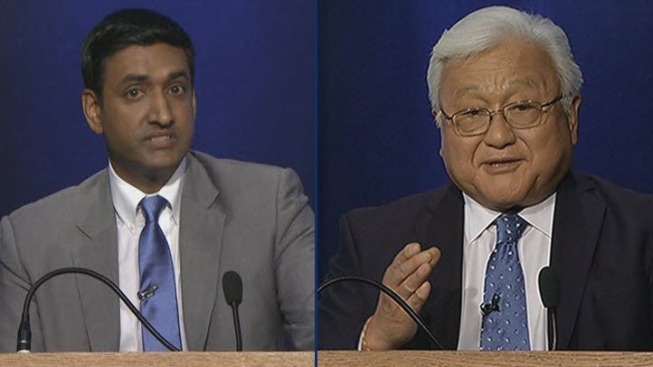 The Khanna campaign told NBC Bay Area it has not evaluated the Honda campaign's complaint yet, but called the lawsuit a "desperate and sad" attempt by Honda to "do and say anything to hold on to his seat, including suing anyone who is on track to defeat him." But getting the access isn't all that Honda is upset about. He's claiming in the suit that Parvizshahi continued to edit, review and make changes to the sensitive campaign information belonging to the Honda campaign after leaving his internship with the Arum Group. And Honda is alleging that he continued to do so while working for Khanna, a political rival he's now battled, and beat, four times over the same congressional seat in District 17. NBC Bay Area hosted the 2014 race. “There were hundreds and hundreds of documents in that Dropbox folder, many of them with digital fingerprints of Mr. Parvizshahi,” Vedant Patel, Honda’s communications director, said. One of the documents in the Dropbox account detailed information about donors from 2008 to 2014, including private contact information, like email addresses and phone numbers, for nearly 10,000 individuals. Honda claims the Khanna campaign used that confidential information to email six donors to inquire if they “might have time for a call” to discuss Khanna’s race against Honda and sway them away from the 75-year-old, whose Japanese-American family was interned in a camp in the early 1940s. Honda has served in Congress since 2001. Khanna, 40, a darling of the younger Silicon Valley tech industry, served in the Obama administration as deputy assistant secretary at the U.S. Dept. of Commerce. He has also lectured at Stanford and Santa Clara University in economics and law. Honda's campaign also alleges that a document containing confidential donor information, which was anonymously sent to and subsequently published by San Jose Inside in 2015, “matched perfectly” with a donor document contained within the Dropbox folder accessed by Parvizshahi. Associate political science professor Melinda Jackson calls the lawsuit a “September Surprise,” but says it’s too early to tell how the accusations will impact the November election. Khanna topped Honda in the June primary by just 2,000 votes.